The pub rock squall of guitars sets the stall out perfectly for slot developer NextGen Gaming’s slice of high-octane, hi-throttle action: Easy Slider. 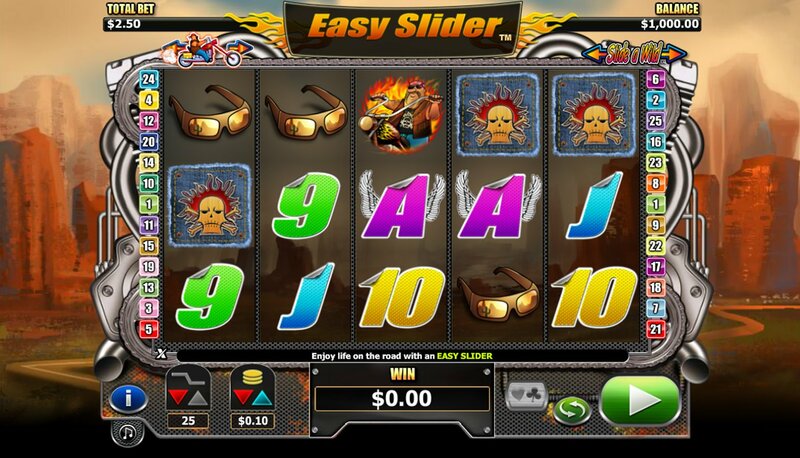 Set in the world of fast bikes and burnin’ rubber, Easy Slider is a 5 reel, 25 pay-line slot with revs and guitar riffs galore. What’s more, there’s an interesting ‘Slider’ feature where you can affix Wilds and multipliers to specific reels to spice your slots action up a bit. On the reels are plenty of Hell’s Angels-style icons, such as a pair Raybans, a hairy biker, a skull and crossbones tattoo, a crash helmet, and some flaming 9-through-Ace symbols. The flame-haired babe is the game’s Wild, and she substitutes for all regular symbols in the game other than the Scatter. Five Wilds across the reels pays out a 500-coin jackpot. The Slide-a-Wild feature allows you to add Enhanced Wilds to your selected reel. Enhanced Wilds appear in a stack on the selected reel. Just hold the Harley Davidson at the top of the screen and slide it along until you hit the reel you want to select. 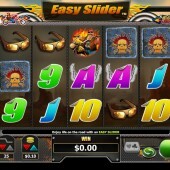 For example, your slider on reel 1 gives you Stacked Wilds and a 2x multiplier on regular wins, and a 4x multiplier during free spins. Three or more flaming bike wheel Scatters on the reels anywhere triggers a free spins round with 15 free spins awarded. All Enhanced Wild wins are doubled. The free spins round is pretty nice, and you can really get some nice wins with re-triggered free spins. The music can be annoying (just make sure you flick the ‘OFF’ button when you start) but overall this is a nice addition to the pantheon of heavy metal-related slots out there. If you liked this, make sure you try out a couple of other top Hell’s Angels-themed games on the market. Betsoft Gaming’s customary flair comes into play at their heavy metal-tinged Slots Angels game, while iSoftBet’s comic take on the biker, Motorbike Monkey, is a fun slot for any Harley Davidson fans out there.